I think the whole point of Chris’ 2018 Hackaday Superconference talk is precisely what I was trying to get at when I made my “discovery” — we all have circuits that just work for us, and the more you have, the better. Most readers will recognize Chris from such venues as The Amp Hour, a weekly podcast he hosts with Dave Jones, and his KiCad tutorial videos. 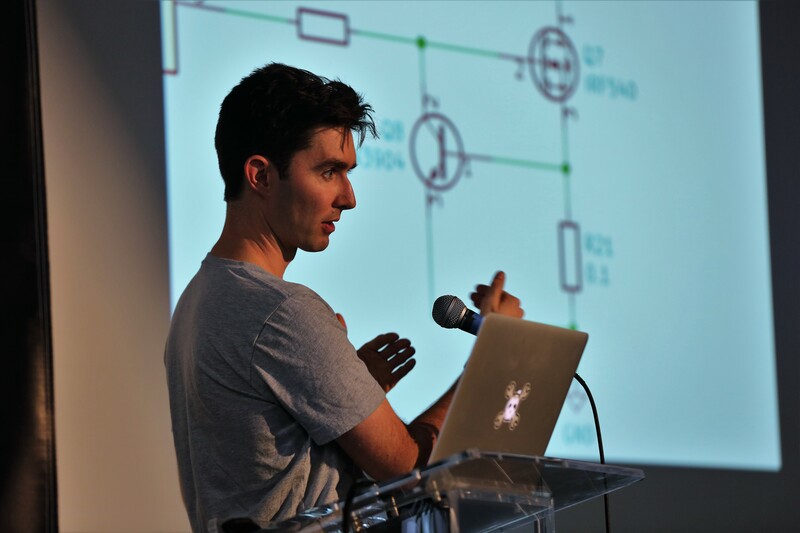 Chris has been in electrical engineering for nearly twenty years now, and he’s picked up a collection of go-to circuits that keep showing up in his designs and making life easier, which he graciously shared with the crowd. As Chris points out, it’s the little circuits that can make the difference. Slide after slide of his talk had schematics with no more than a handful of components in them, covering applications from dead-simple LED power indicators and switch debouncing to IO expansion using a 74HC595. And as any sensible engineer might, Chris’ toolbox includes a good selection of power protection circuits, everything from polarity reversal protection with a MOSFET and a zener to a neat little high-side driver shutoff using a differential amp and an optoisolator. My favorite part of the talk was the “Codeless” section — things you can do with discrete components that make microcontroller circuits better. We see the “You could have used a 555!” comments from readers all the time, and Chris agrees, at least to a point. He aptly notes that microcontrollers can wake up with their IO pins in unknown states, and offered several circuits to keep the potential for mischief at bay, such as Schmitt trigger power-on reset or the simple addition of a pull-down resistor to default a MOSFET to a safe state. There’s a lot that code can accomplish, but adding just a few parts can make a circuit much safer and useful. Chris acknowledges that in any audience, everyone is always at different places with regard to their hardware learning curve, so what’s old hat to someone might be a fresh revelation to another. Still, everything is new to someone at some point, and that’s often the best time to write it down. That’s what I did all those years ago with that voltage multiplier, and it never left me as a result. It’s good advice, and if you haven’t started building your own circuit toolbox, now’s the time. The eternal enemy of [James Puderer]’s pockets is anything that isn’t his smartphone. When the apartment building he resides in added a garage door, the forces of evil gained another ally in the form of a garage door opener. So, he dealt with the insult by rigging up a Raspberry Pi to act as a relay between the opener and his phone. The crux of the setup is Firebase Cloud Messaging (FCM) — a Google service that allows messages to be sent to devices that generally have dynamic IP addresses, as well as the capacity to send messages upstream, in this case from [Puderer]’s cell phone to his Raspberry Pi. After whipping up an app — functionally a button widget — that sends the command to open the door over FCM, he set up the Pi in a storage locker near the garage door and was able to fish a cable with both ethernet and power to it. A script running on the Pi triggers the garage door opener when it receives the FCM message and — presto — open sesame. At this year’s Consumer Electronics Show, Chumby unveiled their latest prototype. It’s a network connected digital picture frame that runs Flash widgets. Just like the current Chumby model, they’re publishing the software and hardware under a license designed to let you hack it. They let us borrow one of their open chassis evaluation kits to teardown and photograph. We’ve got more pictures, full specs, and the schematics below. [floe] wrote in to tell us about his multitouch based thesis work. While many projects have focused on the hardware side of multitouch, TISCH is designed to promote the software side. TISCH is a multiplatform library that features hardware abstraction and gesture recognition. This takes a lot of weight off of widget developers since they can specify known library gestures instead of writing the exact motions from scratch. Using TISCH also means a standard set of gestures across multiple widgets, so the learning curve will be much easier when a user tries out a new app. If you’re researching multitouch, check out this project and help improve the codebase.